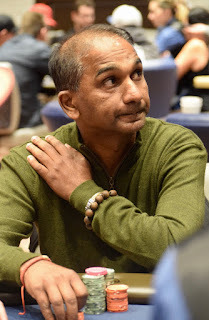 Ravi Udayakumar moves all in for 980,000 on the all-clubs flop and Eddie Barna calls to put Udayakumar at risk of finishing in 9th place. Barna has Pocket_Aces to the Ace_Nine of Udayakumar, but the Ace_of_Clubs belongs to Udayakumar for a flush draw. Not only is the turn a club but the river as well, Udayakumar has the Ace for the better flush and a full double to 2 million.